DUBAI/SANAA (Reuters) - Both brothers who carried out the attack against satirical weekly Charlie Hebdo travelled to Yemen via Oman in 2011 and had weapons training in the deserts of Marib, an al Qaeda stronghold, two senior Yemeni sources said on Sunday. This is the first confirmation by Yemeni officials that both Cherif and Said Kouachi, who carried out one of the bloodiest Islamist attacks on the West in decades, had visited Yemen where al Qaeda's deadliest franchise, AQAP, is based. U.S., European and Yemeni sources had previously confirmed a visit by Said Kouachi. 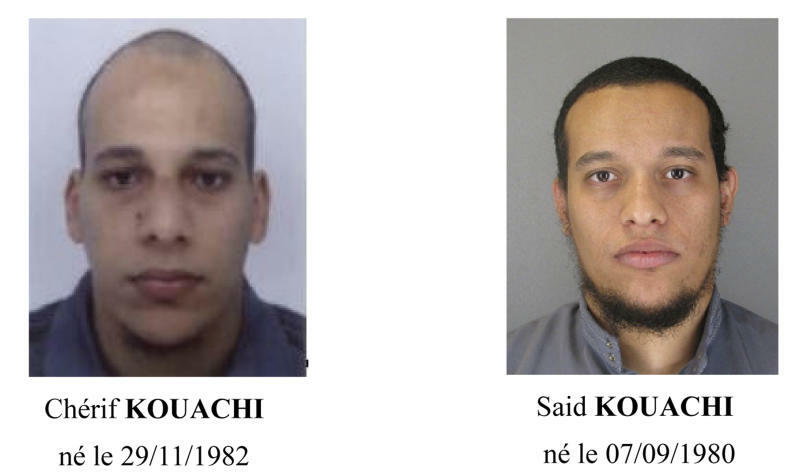 The Paris attack puts a fresh spotlight on the AQAP branch which has recently focused on fighting enemies at home such as government forces and Shi'ite rebels but still aims to carry out attacks abroad. A concerted government campaign last year and repeated U.S. drone strikes on AQAP figures had also created a belief that it lacked the capability to launch any major attacks abroad. Al Qaeda-linked militants have managed however, to target Westerners, including a Frenchman, in Yemen in the past year. "These two brothers arrived in Oman on July 25, 2011, and from Oman they were smuggled into Yemen where they stayed for two weeks," a senior Yemeni security official, who declined to be named, said. "They met (al Qaeda preacher) Anwar al-Awlaki and then they were trained for three days in the deserts of Marib on how to fire a gun. They returned to Oman and they left Oman on Aug. 15, 2011 to go back to France." A senior Yemeni intelligence source confirmed the brothers had entered Yemen via Oman in 2011, citing the ease with which they entered while the security forces were focused on the Arab Spring protests that were convulsing the country at the time. The source also confirmed the brothers had met Awlaki “and trained in Wadi Abida,” – which is between Marib and Shabwa provinces where Awlaki was known to move freely. 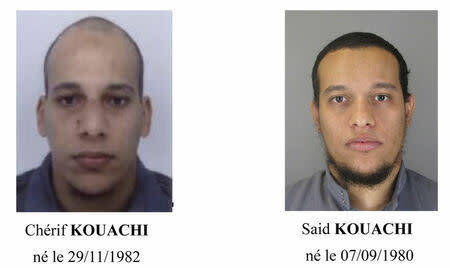 The Kouachi brothers were shot dead by French security forces after they took refuge in a print works outside Paris. Awlaki, an influential militant recruiter, was killed by a suspected U.S. drone strike in Sept. 2011. Cherif Kouachi told a television station he had received financing from Awlaki and that he had been "sent" by al Qaeda in Yemen. The security official said there had been no known communication between the brothers and AQAP since they left Yemen. Counter-terrorism officials are trying to work out whether AQAP directed or orchestrated the attacks in any way, possibly over years, or simply inspired them. Al Qaeda's most effective English-language propagandist, Awlaki was tied to a string of militant attacks and plots including the killing of 13 people at the Fort Hood, Texas, military base by a U.S. army major, a failed attempt to down an airliner over Detroit, the stabbing of a British lawmaker and the involvement of a British airline employee in a plot to plant explosives in an aircraft. Despite Awlaki's demise, AQAP has continued to be the al Qaeda wing most focused on attacks in the West, even as it fights domestic foes in Yemen, diplomats say. The wider al Qaeda network has been eclipsed in the past year by the Islamic State, an al Qaeda offshoot which controls large swathes of Iraq and Syria and that has earned a reputation for beheading foreign hostages. But Western officials say the network is still a top threat. Investigators have focused for months, for example, on possible links between AQAP, renowned for its expertise in bomb making, and al Qaeda cells in Syria known as the Khorasan group, which diplomats say is believed to be planning attacks in West. In Yemen, France has been the target of security incidents. Last May, gunmen shot dead a Frenchman working as a security agent for the EU mission in the Yemeni capital Sanaa. Yemen later said it had killed the militant responsible for the attack. In April 2013, a gunman fired shots outside France's embassy in Yemen. No group has officially claimed responsibility for the Charlie Hebdo attack that killed 12 people. But a prominent AQAP leader said in an audio recording posted on Youtube on Friday that "faithful soldiers of God" had taught the French the limits of freedom of speech after insulting the prophets, including Mohammad. Aspects of the Paris incident suggest a degree of training and planning, possibly with support from a team. The stability of Yemen, which shares a long border with the world's top oil exporter Saudi Arabia, is important for the United States. Hundreds of foreigners flock to Yemen every year to study Arabic or Islamic theology, often enrolling in schools run by hardline Sunni Muslim Salafists some of whom are thought to have links to al Qaeda. One of the most prominent schools, Dar al-Hadith, was forced to relocate after an attack by Shi'ite Muslim fighters on its northern Yemen headquarters in the town of Damaj last year. Last week, the Yemeni Interior Ministry said police had arrested three foreigners in Sanaa after one of them was found to have al Qaeda material in his possession. In May, Yemeni security forces arrested two French citizens believed to be members of an al Qaeda cell in Yemen.